Being able to capture an aerial picture of a waterfall gives one visiting Southern Labrador a different perspective of the landscape of the Mealy Mountains. Rugged rocks are the ideal place for a waterfall to create small and large tiers of water as the snow melts off the Mealy Mountains. Aerial view of a waterfall in the Mealy Mountains in Southern Labrador, Labrador, Newfoundland Labrador, Canada. 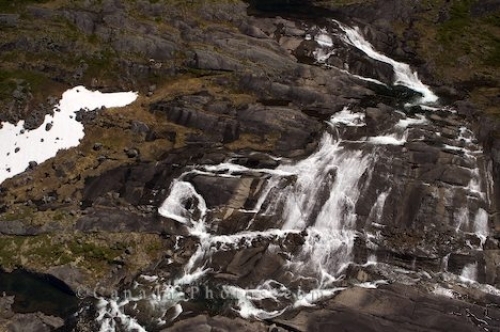 Aerial of a waterfall that cascades down the rocks of the Mealy Mountains in Southern Labrador as the snow melts.